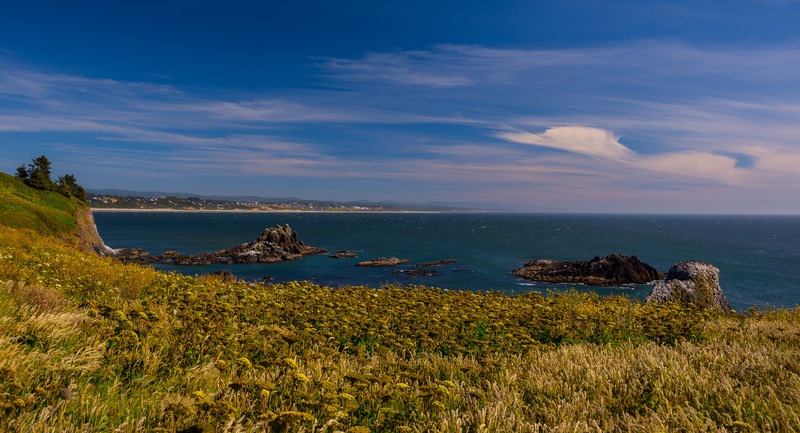 We took another day to visit Yaquina Head and the nearby town of Newport. The Head is where we stopped briefly on an earlier trip and saw the Peregrine Falcon chicks. All four had fledged just a few days before this visit. I took that second photo just because I was impressed with the tenacity of the one tree…not only had it chosen to grow on a massive rock that faced the ocean’s constant fury, but it overcame whatever adversity it encountered with its roots so that it grew bigger and stronger than ever! The third photo impressed me once again at the willingness of so many aquatic life forms to grow in the roughest places…and their ability to do so with lovely results. 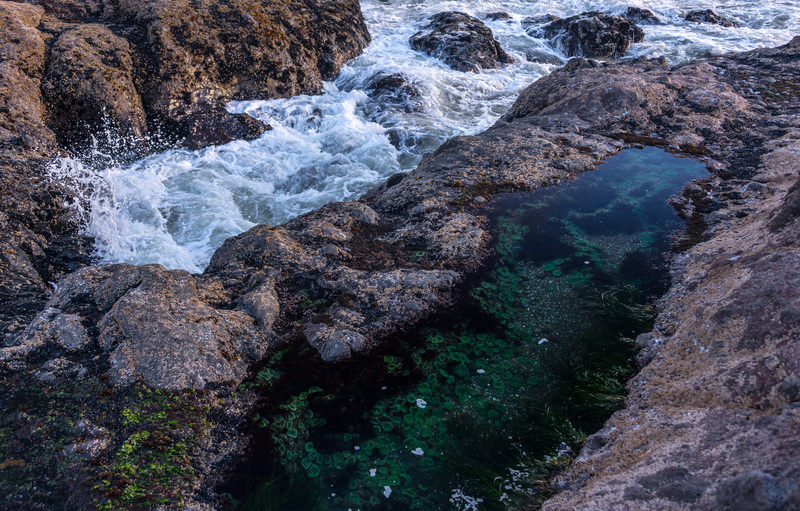 This tiny pond contains dozens…maybe hundreds…of anemones that provide a deep green color to what might otherwise be just a dark, slimy pool. They actually wait here at low tide, figuratively holding their breath until fresh waves of sea water wash over them at high tide! 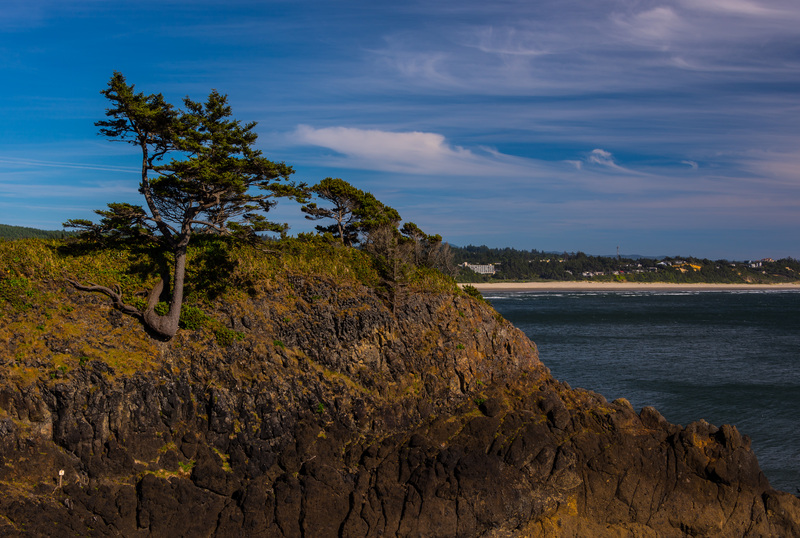 The first photo provides a distant look at the town of Newport, Oregon. 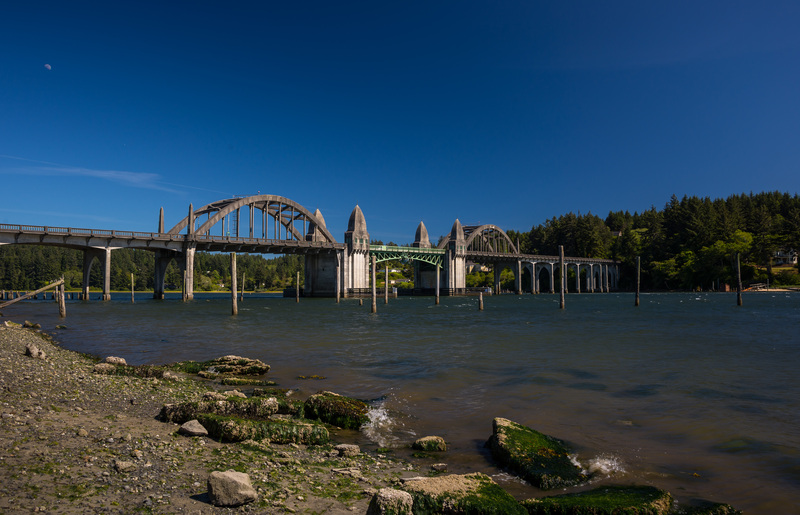 I am giving this lovely town short shrift in this post by showing a photo of just one of its interesting features: the bridge that crosses the Yaquina River near where it empties into the ocean. I have enjoyed a number of Oregon coastline bridges, many of which were designed by Conde McCullough, as was this one. It is listed in the US National Register of Historic Places. Oh, and I couldn’t resist including the daytime moon high overhead.